Watching Niles Peacock of 190 Sunset in Edmonds make a drink is like watching ballet. The man has a gift. 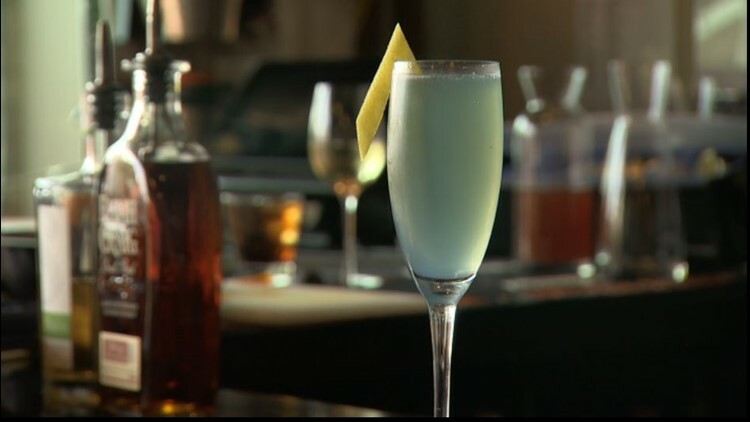 A Niles Peacock drink might contain a chemistry lesson: “Now watch this reaction with these bubbles,” he urges as he slips a bit of lemon peel over the rim of a champagne flute filled with something blue – and bubbles boil up. Or it might tell a story: “We're making a drink here called The Girl Next Door... we're going to make this drink with 1 ounce of barrel-finished gin made by Kim Karrick, The Girl Next Door at Scratch Distillery,” he explained. We peeked into Scratch Distillery, which truly is right next door to the restaurant, and confirmed there is a real-life Girl Next Door; we saw Karrick working at her stills. His drink flavors are as fascinating as those names. That blue drink with the lemon peel? "Sparkling Nightshade. And it's going to taste like a little bit of rose petal, some vanilla, little almond, a hint of lemon,” explained Peacock. "He worked at some of the finest restaurants and clubs in Aspen and Vegas and New York and Miami Beach, and here we are in sleepy Edmonds, we're lucky to have him. I call him 'God's Gift to Anything Liquid’,” said 190 Sunset’s managing partner Tom Budinick. “Service is something that I'm drawn to both professionally and personally whether it is here at work or at the food bank. I like being involved with people, I love interacting with people." Peacock said. That servant's heart -- and those creative cocktails -- make Niles Peacock your winner for the BEST Bartender in Western Washington. This story brought to you by Honda & Toyota of Seattle. Evening is your guide to Seattle and the Pacific Northwest. Watch it weeknights at 7:30 on KING-TV Ch. 5 or streaming live on KING5.com. Connect with Evening via Facebook, Twitter, Instagram or Email.